We provide hotel and hospitality design that leaves a lasting impression on clientele. Hospitality — where image is key and the guest experience is everything. In this industry, leaving a lasting impression on guests is perhaps the greatest promoter of your image. Today's environment needs to evoke the regional culture and local flair in which it resides. Enhancing the guest experience today means creating a unique environment, specific to its locale — taking advantage of local flair, regional flavors, and cultural art. On top of luxury and allure, you also need sustainable design that conserves resources and energy while improving clientele perception and maximizing returns. Every detail, whether aesthetic or functional, should be considered when building or renovating — you know that, and so do we. 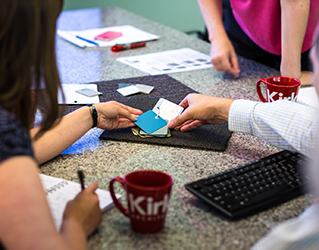 At Kirksey, we believe that creating meaningful and enduring guest experiences for all patrons can be accomplished through the power of smart hospitality design. From flawless hotel interior finishes and lighting to immaculate country club grounds and landscaping, each and every detail is significant when a facility is promoting and building brand image. With a deep knowledge of hospitality architecture, building code, and sustainable design principles, our Hospitality Team has the expertise necessary to craft design solutions that impact everyone who walks through your doors. Our knowledge of the hospitality market is also accompanied by more than 29 million square feet of LEED projects in our portfolio, leading the market in high-performing, energy-efficient buildings that are easier to maintain. From elegant private event spaces with breathtaking views to restaurants providing the best in cuisine and entertainment, we've been a part of creating some amazing venues. We are Kirksey Hospitality, and we're here to assist you in planning your project that will ensure your guests a unique experience worthy of both your brand and clientele. Kirksey's retail and hospitality design experts create high-performing, energy efficient buildings for recreation, relaxation, and consumption.